Looking for a career in human services? Join our caring team. Westbay Community Action, Inc. is an Equal Opportunity Employer. 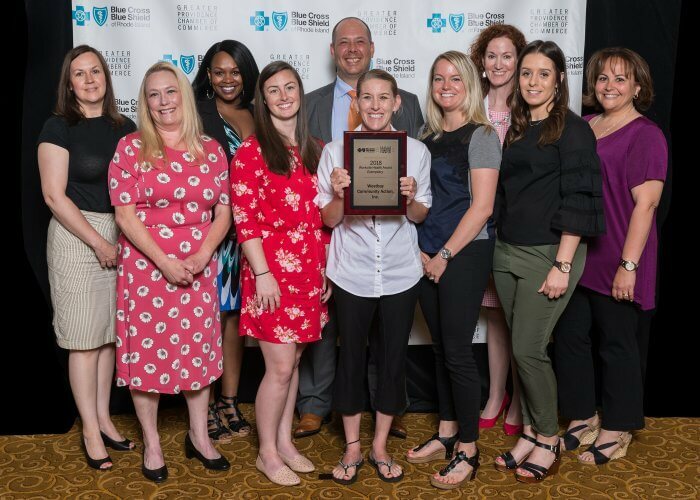 Westbay Community Action, Inc. was recognized with an Exemplary Worksite Health Award from Blue Cross & Blue Shield of Rhode Island and the Greater Providence Chamber of Commerce for effective programs encouraging employee health and well-being in a meaningful way. We are currently seeking a Bachelor’s level CPA to serve as our Chief Financial Officer. The successful candidate will have knowledge of current accounting regulations and the ability to prepare audit paperwork relative to non-profit independent audits. The CFO will continuously analyze the financial condition of the organization, plan for the maintenance of the good financial health of the organization and its programs. Will be responsible to manage the day to day activities of the Finance Department, implement the annual budget process, ensure quality annual independent audit and ensure compliance with all federal, state and non-profit accounting regulations. This is a full time, 40 hour position with benefits including vacation, sick and personal time, 401K retirement plan, medical insurance and more. Please forward cover letter including salary requirements and three professional references along with resume. Extensive knowledge of federal, state and generally accepted accounting standards, including A-133. Active listening skills to hear and take in information from staff, clients, colleagues, etc. The physical demands described here are representative of those that must be met by an employee to successfully perform the essential functions of this job. Reasonable accommodations may be made to enable individuals with disabilities to perform the essential functions. While performing the duties of this job, the employee is regularly required to sit and to talk to hear. The employee frequently is required to use hands, fingers, handle or feel objects, tools or controls and reach with hands and arms. The employee is occasionally required to stand and walk. The employee must occasionally lift and / or move up to 50 lbs. Specific vision abilities required by this job include close vision, distance vision, color vision, peripheral vision, depth perception, and the ability to adjust focus. The environment is a clinical business office environment and community/state based organizations. Potential exposure to blood borne pathogens, respiratory diseases and other infectious diseases, and other biohazardous material requires universal standard precautions. This position requires the individual to have their own transportation, a current unrestricted license to drive, documented auto insurance and the individual must be willing to work in the community. The duties listed are primary functions of the job and are not intended to be all-inclusive. May be called upon to perform other duties comparable to those cited above. Serve as Acting/Interim President/CEO in the absence of the President/CEO. Westbay Children’s Center is seeking to hire a teacher for our Toddler Classroom. This teacher will be responsible for all aspects of the daily classroom environment according to quality indicators included in ITERS and CLASS guidelines as well as for the planning and implementation of the toddler curriculum following program guidelines and curriculum framework. The successful candidate will also supervise staff, classroom volunteers, and children to ensure the safety and well-being of all. He/she will be responsible for assessing the needs of individual children,documentation of daily progress and involving parents in all aspects of the classroom and program. This position is Full Time (40 hrs/week), Monday through Friday at a pay rate of $12.00/hour. The physical demands described here are representative of those that must be met by an employee to successfully perform the essential functions of this job. Reasonable accommodations may be made to enable individuals with disabilities to perform the essential functions. While performing the duties of this job, the employee is regularly required to sit and to talk to hear. The employee frequently is required to use hands, fingers, handle or feel objects, tools or controls and reach with hands and arms. The employee is occasionally required to stand and walk. The employee must occasionally lift and / or move objects and/or children up to 50 lbs. Specific vision abilities required by this job include close vision, distance vision, color vision, peripheral vision, depth perception, and the ability to adjust focus. The environment includes a school classroom. Potential exposure to blood borne pathogens, respiratory diseases and other infectious diseases, and other biohazardous material requires universal standard precautions. This position requires the individual to have their own transportation, a current unrestricted license to drive, documented auto insurance and the individual must be willing to work in schools and the community. The duties listed below are primary functions of the job, and are not intended to be all inclusive. You may be called upon to perform other duties comparable to those cited. Document daily progress for each child (child portfolio), enter information into web based program (GOLD©), prepare progress reports and communicate results to parents regularly. Westbay Children’s Center is seeking to hire a Teacher Aide to assist the classroom teacher in all aspects of the classroom functions. This includes planning activities and implementing them, teaching, supervision of children, and maintenance of the classroom environment. In the absence of the teacher, the successful candidate will assume full responsibility of the classroom function. This is a full time, 40 hour/week position at a pay rate of $10.85/hour. The hours will fluctuate M-F between 7am and 5:30pm based on the needs of the Center. The duties listed below are primary functions of the job, and are not intended to be all-inclusive. You may be called upon to perform other duties comparable to those cited. We are seeking a dedicated case manager who will be responsible for safe delivery of food to homebound seniors and disabled adults. The successful candidate will also complete comprehensive client wellness assessments. This is a full time, 37.5 hour/week position (M-F 8:30-4:30) with a pay rate of $15.00/hour. Must be able to identify emergency situations; and have patience and good people skills. The physical demands described here are representative of those that must be met by an employee to successfully perform the essential functions of this job. Reasonable accommodations may be made to enable individuals with disabilities to perform the essential functions. While performing the duties of this job, the employee is regularly required to sit and to talk to hear. The employee frequently is required to use hands, fingers, handle or feel objects, tools or controls and reach with hands and arms. The employee is occasionally required to stand and walk and travel up/down stairs. The employee must be able to lift and / or move up to 75 lbs. Specific vision abilities required by this job include close vision, distance vision, color vision, peripheral vision, depth perception, and the ability to adjust focus. The environment includes a clinical business office environment, client’s homes and community based organizations. Potential exposure to blood borne pathogens, respiratory diseases and other infectious diseases, and other biohazardous material requires universal standard precautions. This position requires the individual to have their own transportation, a current unrestricted license to drive, documented auto insurance and the individual must be willing to work in client’s homes and the community. The duties listed below are primary functions of the job, and are not intended to be all-inclusive. You will be called upon to perform other duties comparable to those cited. Follow all the procedures necessary to deliver food in a timely, safe, and proper fashion. Collect and bag food items for homebound clients to transport. Provide case management services, including initial contact with the client. Conduct a client assessment pre, quarterly, and post. Create and maintain a client list and delivery route as well as a schedule. Notify Supervisor of any change in client’s status or inability to deliver food. Maintain correct temperatures for food by keeping food in proper storage containers provided and keeping containers closed during transport. Make sure vehicle maintains valid inspection and vehicle registration and insurances. Maintain a clean vehicle (exterior and interior) as needed. Deliver program materials and information. If client is not home leave the client a door tag. Wear agency issued Westbay name badge at all times.